We used to be able to have responsive emails on android from the default "email" app. With the latest Android L i installed today opening the email app you now get a screenshot saying to use the new gamil app instead which obviously still has no CSS support. So from android 5L onwards we no longer have support for responsive emails, Lets hope the device manufacturers add some support for there own email clients. The best way to make them fix this (in my opinion) is make all our emails ridiculously cool on iOS. That way consumers will start noticing and downloading better rendering email apps that's the only thing Android will listen to. I suppose we could prey that the new Gmail app will support styles, but I doubt it will. I think Mark's referring to Inbox. Nah, Inbox has no support for styles, got my invite this morning. I disagree with that approach, We have to design towards what people are using. If you have a good percentage of webkit subscribers then enhance the experience for them and fallback to a working version for the others. Hopefully people will realise they are missing out on the enhanced user experience and change client. Much like when people started moving from the default IE and Safari to the more advanced Chrome and Firefox. In the dream world, we might wish to hope that we would gather that many coders, having their very own webkit-ed design, for the effect to be felt by so many people, that Google / Gmail teams would react. On the other matter of Gmail not evolving, and furthermore litteraly destroying enhanced Responsive workouts, it makes it so problematic... There are a great deal of HTML integrations that will fully regress to a normal display, and be a worldwide waste of time, which is a shame. The non-support of CSS by Gmail is not new to anyone, especially them. The question is : Why in the world do they not do something about it ? Or even, create a whole lot of specific tags / class / -googlekit / who knows what, that us coders would use for integration nicely on Gmail. If, for starters, they would let the style="display: ...", work in media queries, that would mean the world, and re-open a great deal of options. So, see, I also dream on my end. At Inboxlove last month Google said media query support is "a priority" for Inbox, we can hope they'll do this for the Gmail app too. Also Gmail webmail already supports a limited level of CSS and media queries nothing on the app yet where it would actually have a purpose. If they would simply use the webmail rendering for the app that would be a start. Well, I'm guessing this will only be for Vanilla Android Devices. Betting the likes of Samsung/Sony/LG/etc will still have their own email apps people can use if they don't want to use gmail. Though I know the new version of Gmail will allow all emails to filter into it. We just installed a version of Lollypop on an emulator and it came with a Android email app in the same orange colour matching the above screen shot but with a working, fully redesigned Android native email client. We're using an emulator and pretty buggy so can't do much testing with it at the moment but there is an app there, and it's not telling us to use Gmail. Obviously the screenshot tells a different story. So no idea what's happening? @stephen is there any more info when you click the learn more button? This reminds me of the messages that browsers will display when they are trying to capture market share—you download, install, and they try to get you to check a box using that browser as the default moving forward. 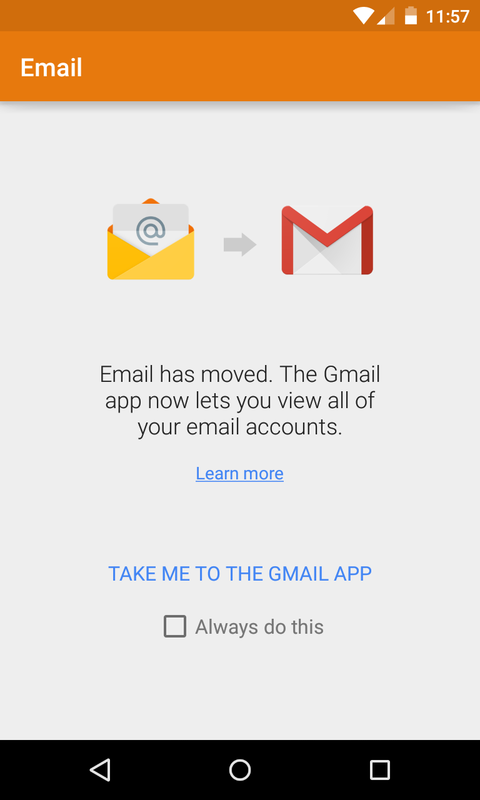 The "always do this" checkbox leads me to believe that they want you to use the Gmail app, but it's not a requirement, and that the email app isn't going away (at least not yet). So it may be quite awhile until it's actually dead. Gmail parses the code server-side and give all apps and webmail the exact same code. It gives them endless possibilities for proprietary non-standard html tags. Perfect exemple is the grid item-prop div. this only emphasize a huge issue - that Litmus needs to update the emulators - right now we have big issues regarding 4.4.4 - but we're not able to spot these issues using Litmus? Right now you're offering an emulator that was released 1 year ago!!! - I'm not impressed. We have been using Litmus for more than 3 years - but this is just not good enough. We're always looking into adding support for more email clients and operating systems. The truth is, though, that we have to prioritize which clients and operating systems we support. Since Jellybean is still the most widely used release of Android, that's where we focus our efforts. Our engineering team is constantly looking at and testing out newer releases, but, at least for Android, our options generally follow the state of adoption in the Android world–which tends to lag far behind something like iOS adoption. If you have specific stuff you want to see, you can always email us at hello@litmus.com with your suggestions, and we'll keep you updated on future updates! Do you have a specific example of something that changed in 4.4.4? I'd always suggest for specific issues to test manually, no service can compare to rigorous troubleshooting.